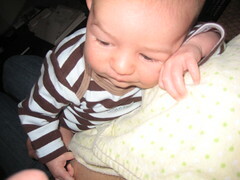 Posted by Jessica at 4:32 p.m.
March 5, 2009 at 6:17 a.m.
March 5, 2009 at 6:28 p.m.
What a doll!! I've always said "who needs TV when you have kids." There's just nothing like watching a little one grow and develop. You can almost see their brains absorbing information every minute! 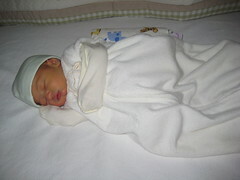 Congratulations on your new addition and for your wisdom in taking the time to enjoy him now! 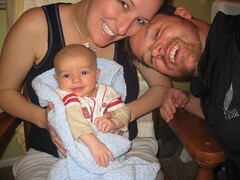 March 10, 2009 at 11:59 a.m.
Look at that last photo - already mugging for the camera...love it. 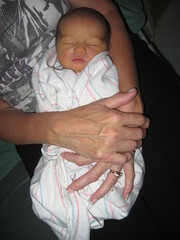 March 10, 2009 at 1:13 p.m.
What a cutie! It's about time we get to meet him! Congratulations on having a baby that likes to sleep. March 13, 2009 at 7:07 p.m.
March 15, 2009 at 8:20 p.m.